Somewhat by surprise, the wild ape and the robo-ape proceed to engage in a fierce carpentry competition. It’s unclear who won, but let’s just say that man’s creation is no match for God’s precious creature. 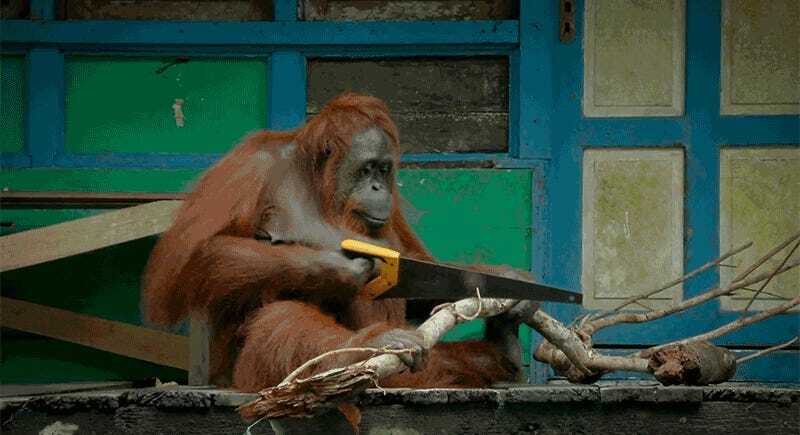 It’s also unclear if the wild ape figured out how to use the saw by watching the robot—which is perhaps some cruel foreshadowing for the human race and our artificially intelligent overlords. It’s hard to say which is more moving, this new ape vs. robot clip from Spy In the Wild or last week’s clip of lifeless monkey tricks real monkeys into being sad. Either way, we’re looking forward to more from Spy In the Wild which premieres on PBS on February 1st. It will surely be a nice relief from the animals and robot villains who currently run our allegedly soon-to-be great country.